Based on this relationship, any show they start I approach carefully and that’s how I started with Defiance. I had a love/hate relationship with this show… at first. It has since won me over with all its kitsch, clichés and sci-fi rip-offs. Everything I hated at first, I now love. My first reaction to this show was that it was just a wannabe Firefly, Farscape and BSG rolled into one. It had no novel ideas (except the whole game tie-in) and my expectations were set really high. Syfy did a boatload of advertising for this show and it had great names tied to it (Rockne S O’Bannon, Kevin Murphy). I was underwhelmed. There were lines I actually cringed at in the writing. I believe in The Serpent’s Egg Mayor Rosewater (Julie Benz) actually said, “Take her away.” I mean, really? But then I think I started to ‘get it’… That was this show’s charm – they could write lines like that. Maybe the mayor had waited her whole life to say that classic line. I can see the writers giggling and thinking, I know that’s the ultimate cliché, but damn it just fits so well! On the other hand, the effects are just okay (c’mon, Syfy, you know it!) given the budget this thing claimed, everything looks like the game. But again, I’m pretty sure now, that’s on purpose – tying both worlds together. If it wasn’t on purpose, then it works somehow. The characters. Despite the show having 7 races of Votans plus humans, we really only focus on a few main folks (who are played by an amazing cast). There’s Nolan (Grant Bowler) and Irisa (Stephanie Leonidas), the Human-Irath duo that we meet first and who really carry the show’s perspective. 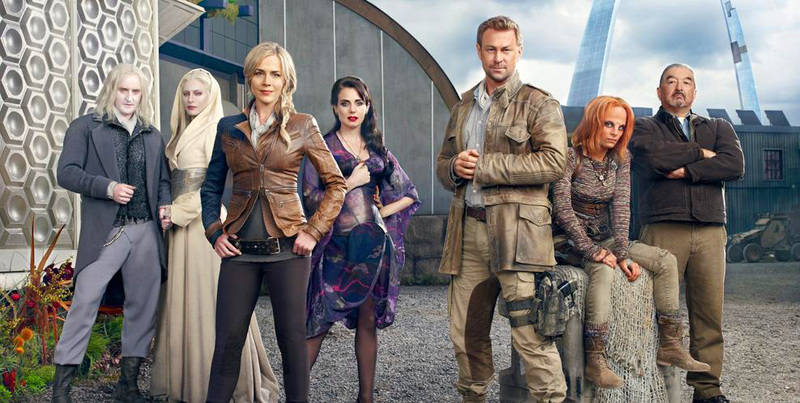 There’s the newly appointed Mayor Amanda Rosewater (Julie Benz) and her brothel running sister Kenya (Mia Kirshner), the Castithan Tarrs – Datak (Tony Curran), Stahma (Jaime Murray) and Alak (Jesse Rath) and the mining family – McCawleys – Rafe (Graham Greene) his two sons and daughter. And you can’t leave out town doctor, Doc Yewell (Trenna Keating). This is the one thing this show does well. You fall for these characters. You hate these characters. You are invested in their stories and outcomes. 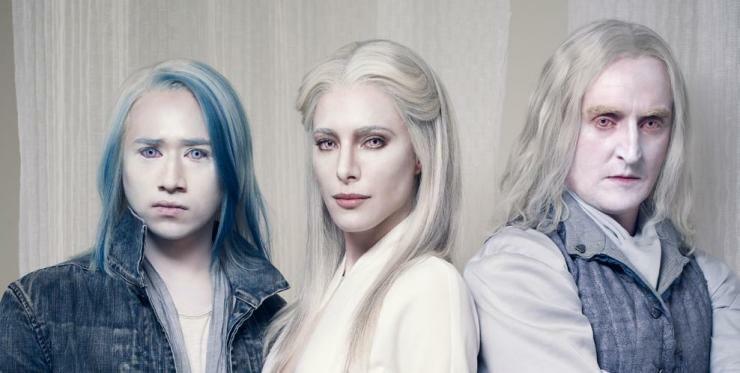 Datak and Stahma Tarr are by far the standout players. Even the Romeo & Juliet story of Christie McCawley and Alak Tarr, which was ANNOYING for the first few episodes, all made sense because of how it wrapped around Datak & Stahma’s plans for power and more importantly, respect. All the characters have nuance and are not one noted, you have to stick with the show to see this, but it is well worth the reveals. The world of Defiance. The writers took their time explaining little things about this new Earth, apart from an opening narrative from Irisa in the pilot, we haven’t learned much about why Earth is the way it is. I admit, I did some research to figure out all the races, what The Pale Wars were, etc.. but I think it was smart not to focus heavily on these aspects. The show, although definitely only works in this new environment, really wants you to focus on the characters. Slowly revealed each episode were hints of what was going on outside of this little town and its inhabitants. Like, there is such a thing as the Earth Republic (E-Reps) and they are pretty much considered an malevolent faction. But the world does look amazing. The terraforming concept is applied really well, with cool looking rock-plants and bright huge flowers, not to mention wolf-spiders that are clearly things of nightmares. So even though this is not the focus, without it, you have really no good setting for these people. The town itself looks gritty and third world-ish, yet you have future tech here and there to remind you it’s in the midst of being rebuilt in the future. The language creator has to be recognized as well. Linguist David J. Peterson (Game of Thrones) has developed two full languages for the different alien races, Castithans and the Irathients, and they are beautiful and sound very natural within this world. The Score. Bear McCreary. That really is all I need to say about this. He is a musical genius. (Check out his work on BSG if you don’t believe me, not to mention – Eureka, Caprica, The Walking Dead, etc…) Bear has managed to create a sound that really echoes the sci-fi elements and emotion for this world. And he’s not only created orchestral pieces, there are many songs he’s written with his brother, Brendan and their band, Young and Beautiful In A Hurry, that reflect the Votan races and their alien-ness. You can stream the score for both the show and the video game on Spotify. The Sci-fi Elements. The sci-fi elements on this show are honest to goodness things you would expect from a show on Syfy channel. There are cold fire guns, light-knives (like pocket knife lightsabers? 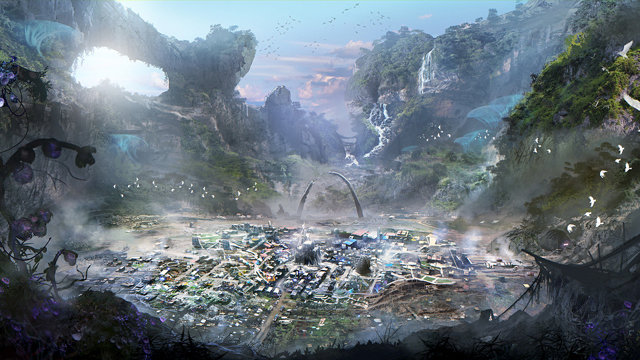 ), the terraforming aspects, ark reactors, the Aliens, razor rain and even electric blue drinks. Let me touch on razor rain for a minute, this is basically a storm where shrapnel from Arkfall rains down on earth and it is nasty. One of the best sci-fi concepts they used. As I said earlier, there are good special effects, they definitely pull from the game, but I’m pretty sure this is done on purpose. They are not great, although there are a couple shots that look pretty damn good, but overall, meh. It’s okay though, it all works together. The Alien makeup is done really well and every race is believable. Look, if you gave up on this show after a few episodes, I don’t blame you. I almost did myself. But I HIGHLY recommend you go back and re-watch and stick it through. When all was said and done, the writers presented a lot of strong story arcs which they completed and at the same time opened up a lot of good questions that will keep you on the edge of your seat until Season 2 hist next summer. Step back, accept the clichés and kitsch, and just enjoy. 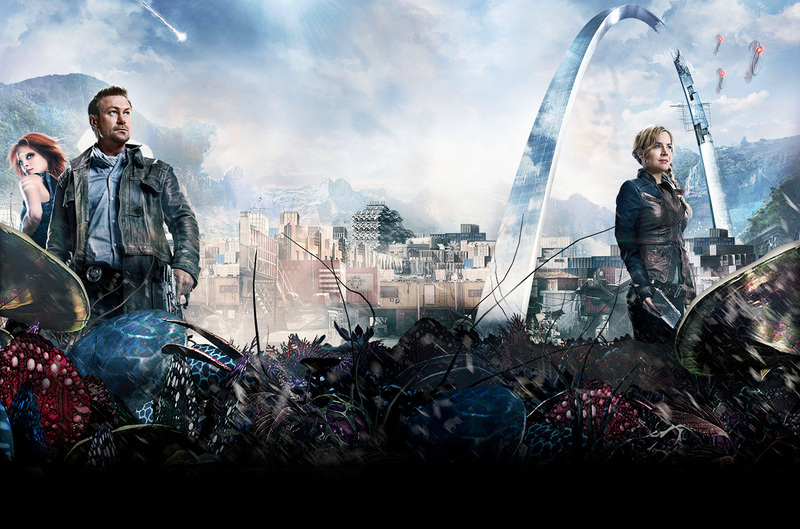 Defiance airs Monday nights on Syfy Channel and will return for Season 2 in June 2014. Follow I’m That Geek on Facebook and Twitter!